Colombia, 2018, dirs. Cristina Gallego, Ciro Guerra, 125 mins. Dates and Venues Opening in cinemas all over Canada (March 1: TIFF Bell LightBox in Toronto and Cinema du Parc in Montreal; March 15: March 15: Mayfair Theatre in Ottawa and Vancity Theatre in Vancouver; March 22: PAC Film House in St Catherines ON and Kingsway in Toronto; March 30: The Broadway Theatre in Saskatoon. Also in theatres in Regina, Victoria, Quebec City, Sherbrooke and Calgary - Dates TBA. This is a superb film, full of suspense and excellent cinematography. The film will make its Canadian premiere at the Toronto Film Festival in 2018. Director Guerra refers to this film as a "a gangster film with an important indigenous element". 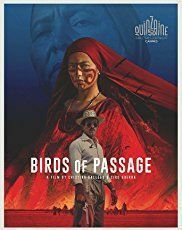 Set in the Guajira Desert in northern Columbia, it chronicles a Wayuu family´s rise and fall in the drug trafficking business. What makes the film unique is it mixes indigenous facets and traditions with the gangster elements. It was selected to open the 50th edition of the Directors' Fortnight section at the 2018 Cannes Film Festival.